Milton, 14 Aphrasia Street, Newtown, City of Greater Geelong. 1. All of the buildings known as Milton comprising the main house marked B-1 on Plan 605974 endorsed by the Chair, Historic Buildings Council and held by the Director, Historic Buildings Council. 2. All of the land described in Certificate of Title Volume 5056 Folio 104, marked L-1 on Plan 605974 endorsed by the Chair, Historic Buildings Council and held by the Director, Historic Buildings Council. Milton was erected in 1857-58 for prominent Geelong pharmacist and politician Charles Kernot. 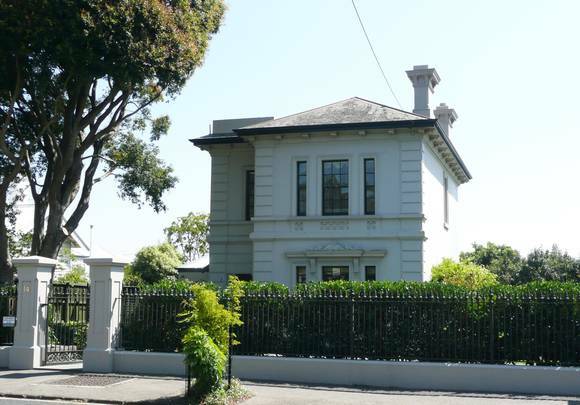 It was designed by leading Geelong architects Backhouse and Reynolds in Renaissance Revival style. It is a two storey asymmetrical stuccoed masonry town house with hipped roof of slate, bracketed eaves and rusticated quoins. Milton is of architectural and historical significance to the State of Victoria. Milton is important as an extraordinary example of the work of leading Geelong architects Backhouse and Reynolds. It is also a particularly fine example of an elegant Renaissance Revival town house of the mid nineteenth century. Milton is important for its association with the Kernot family, with the house being built for Charles Kernot, chemist, stationer, councillor and politician, whose eldest son became the first graduate in civil engineering at Melbourne University and also became that institution's first professor of engineering.